Yea, I’m a hit! 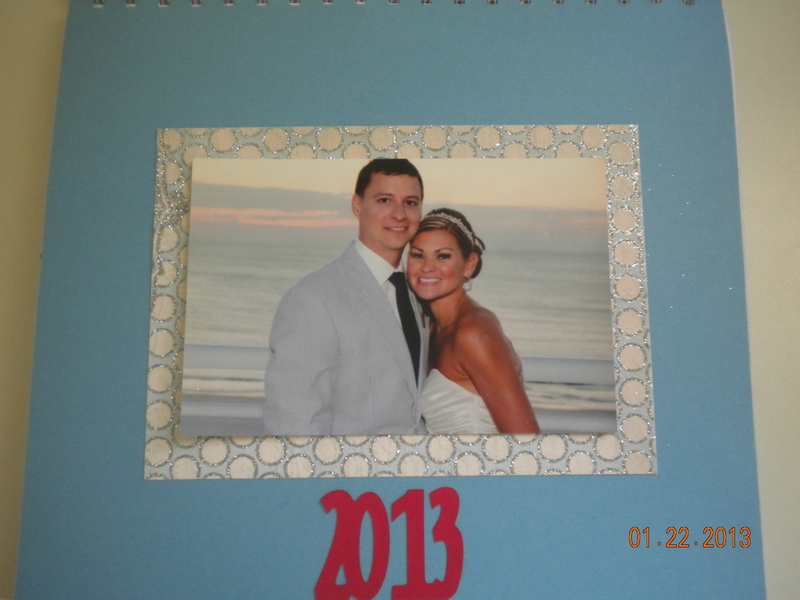 I didn’t have many new pictures of her and Tim, so I told her to send some to my local Walgreens (since she lives in FL) and I would get busy and make her a calendar in January. 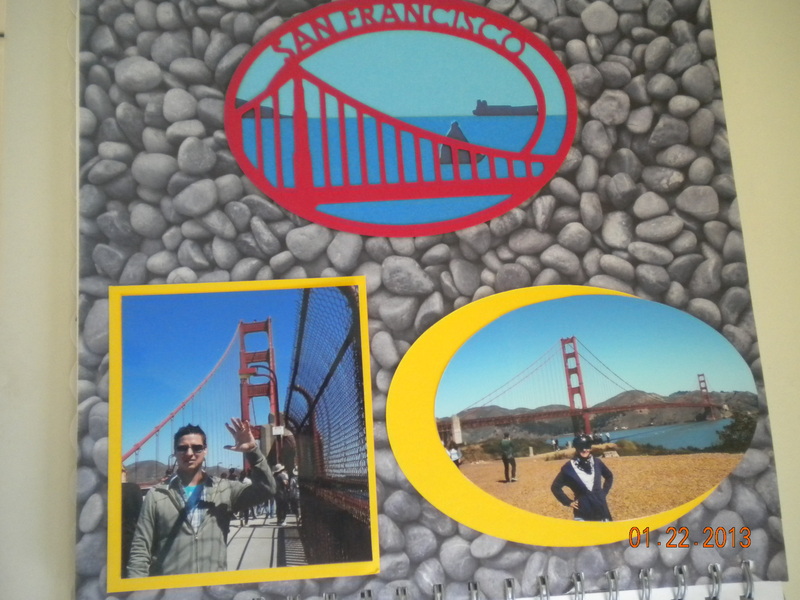 She picked out all the pictures and most of them are from her vacations, so they really don’t match what you would normally see if I was doing a themed calendar. I am only going to post my favorite months. I used the “Designer Calendar” cartridge to cut out all the months. It is a great cartridge and has a font and a themed cut-out with each holiday. I hope you enjoy my daughter’s travels! 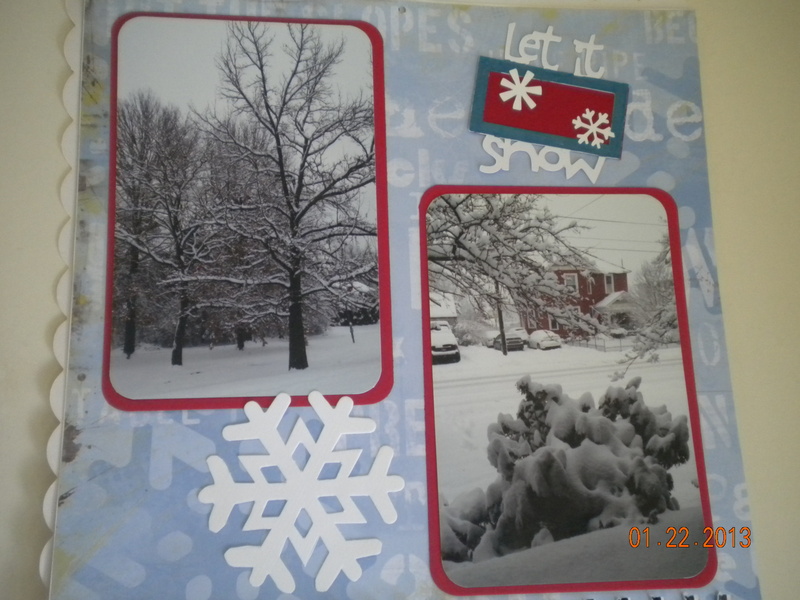 She took these pictures out our front window while she was home for Christmas. This was taken on their Honeymoon. My son-in-law is a huge soccer fan and his team was playing in Boston. I guess the soccer border was from “Sports Mania”. This cartridge has limited uses, but if you happen to go any of the destinations, it is so cool! They were getting ready to bike across the Golden Gate Bridge. I love the San Francisco cut out! 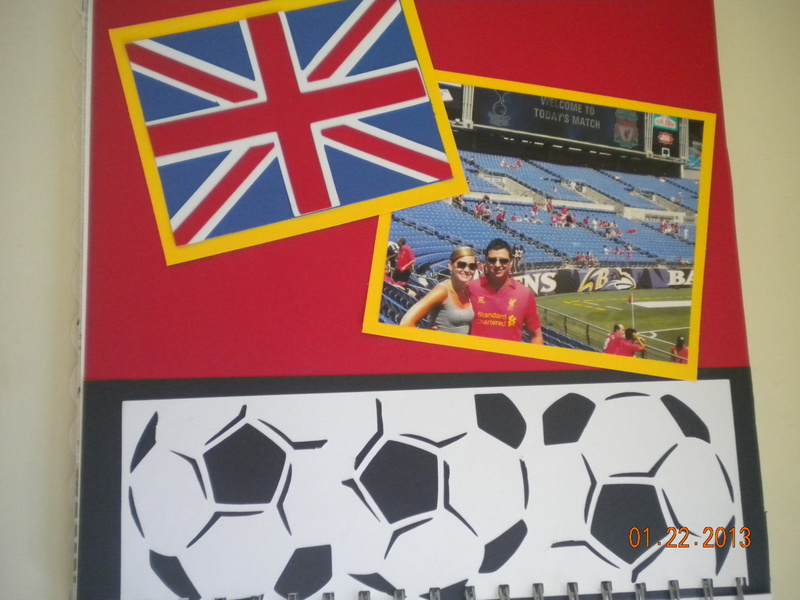 This one doesn’t really show up that great, but it says NEW YORK in the little frame around their picture. 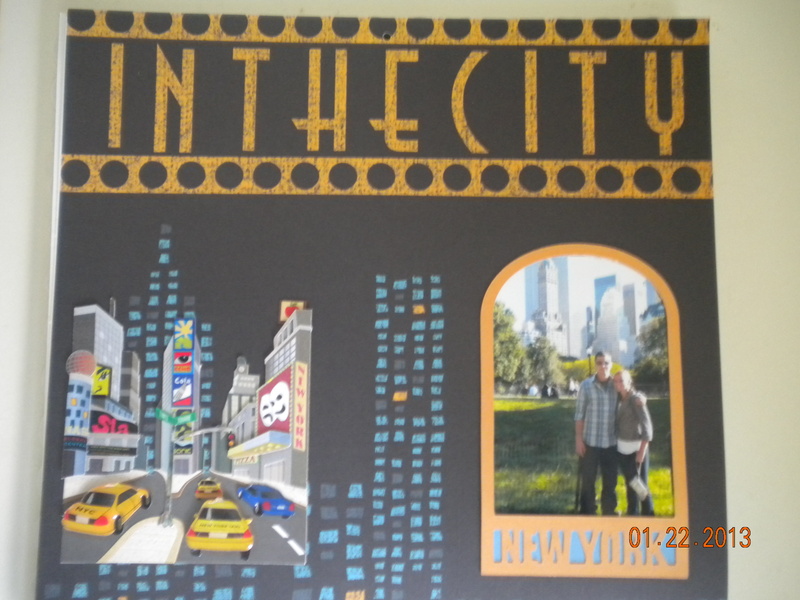 The “In the City” was a sheet of paper in one of those paper packs from JoAnn’s, Travel. The cool taxi’s are a Jole’s sticker from Hobby Lobby. I like to spread my crafting money around…lol. The calendar was a 10 x 10. Remember Spring is just around the corner. Imagine that…I was right! 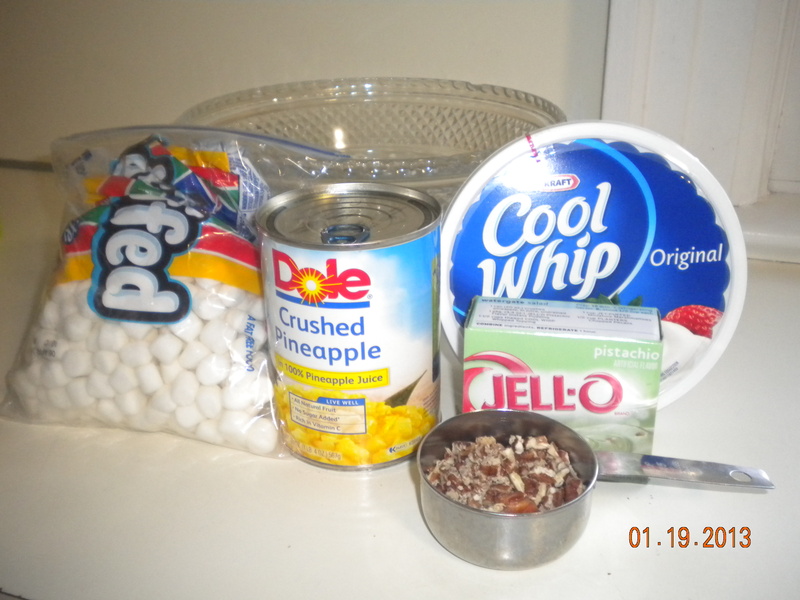 Well it is really fast to make, so here are the directions. 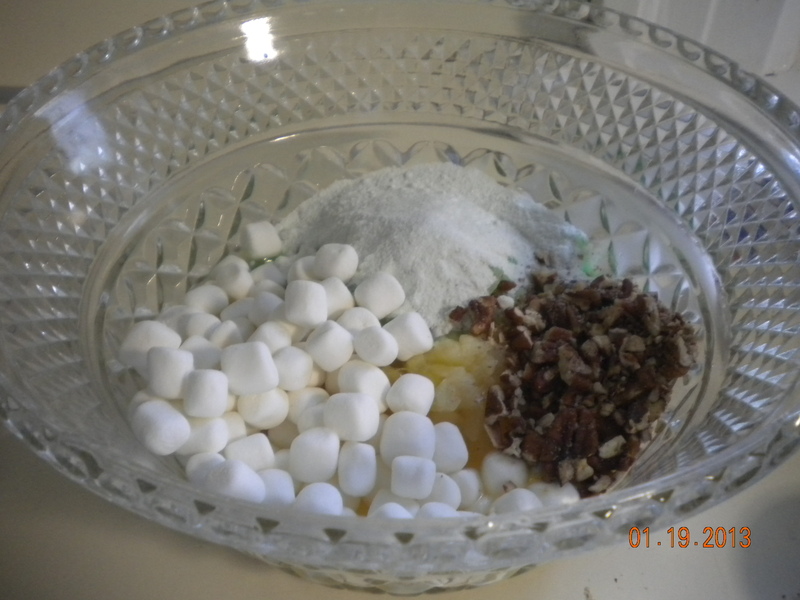 One of the good things about this salad is that if you have some marshmallow that are getting a little hard, the juice from the pineapple will soften them right up! 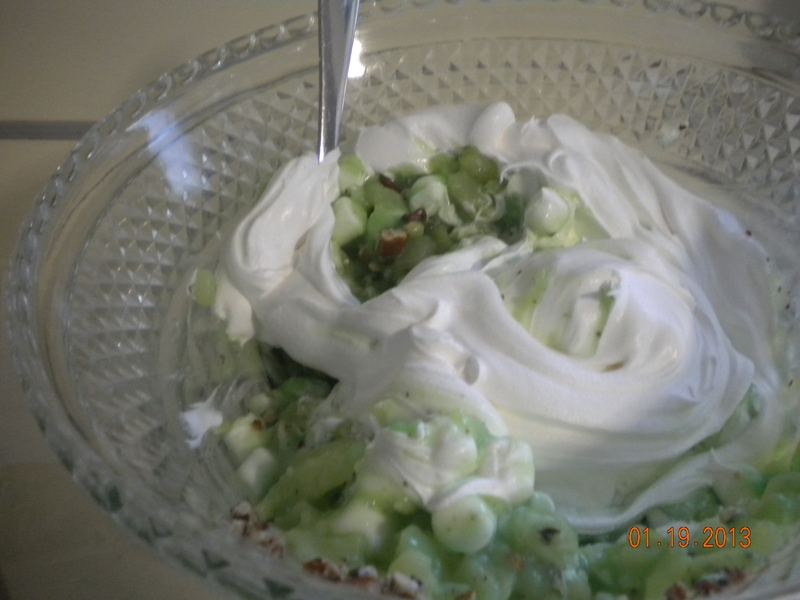 The dark green on top is some green sugar I sprinkled on to give it some color. 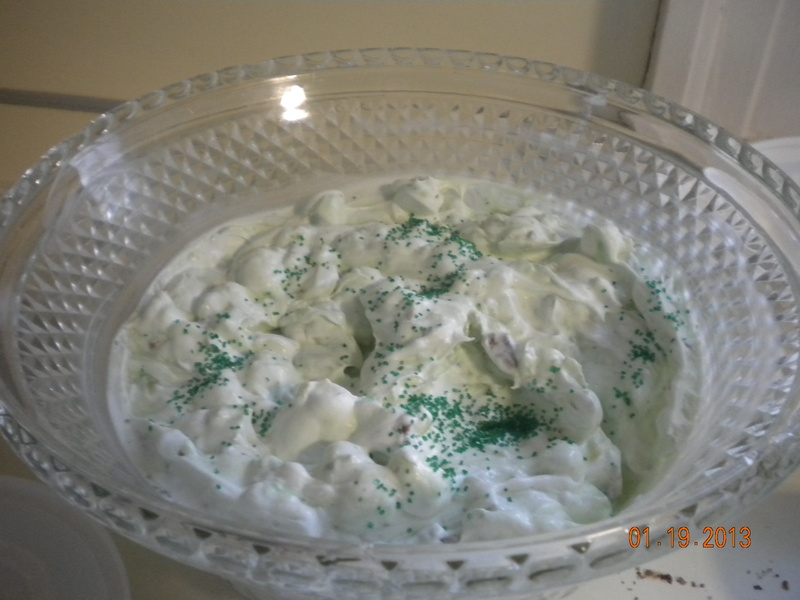 I was thinking that I should have posted this for St. Patrick’s Day. Maybe I’ll post the Watergate cake in March. 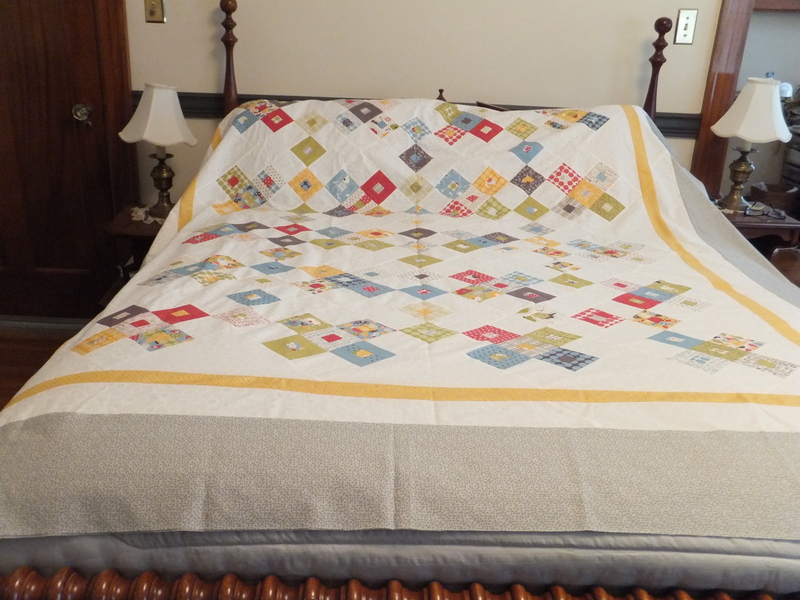 We arrived to a wonderful house that is located next to our favorite quilt shop, Miller’s Dry Goods. 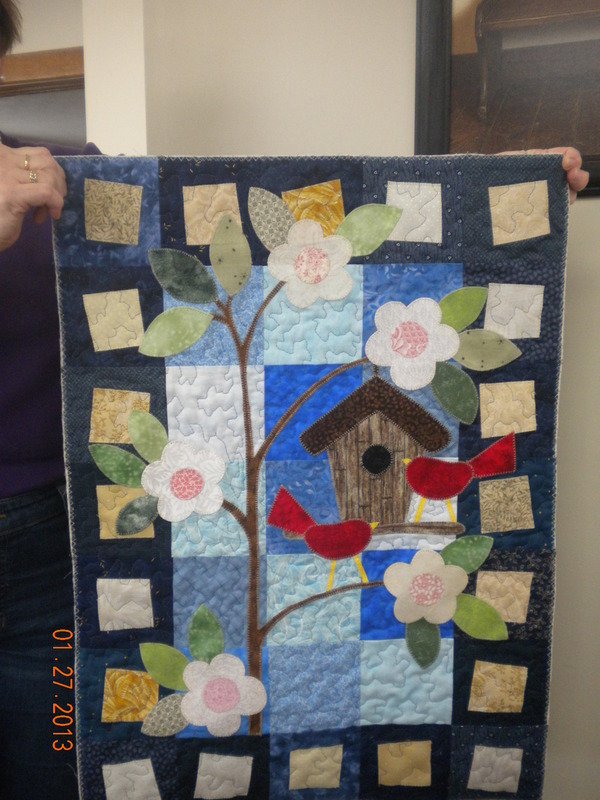 The ladies there run the quilt shop, a cabin retreat behind the shop and this newest addition, The Rural Thimble. I was set up just for quilters. We walked into a big room with overhead lighting and table with comfortable chairs for everyone. We had 4 bedrooms with 8 twin beds and one double bed and they also had a pull out sofa. The kitchen was fully stocked with everything but our food. The ladies started to arrive and we ended up having a great weekend. We watched the snow fall while a big pot of vegetable soup cooked on the stove. We enjoy loads of laughs and great food and even got a few projects finished or at least go a good start. 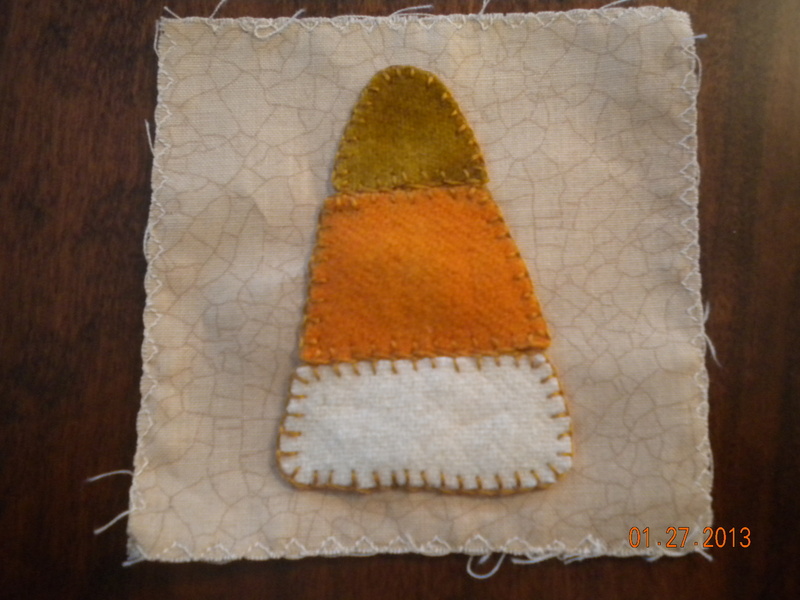 Pam learned how to do the blanket stitch on wool. This was her first wool project. There are 11 other blocks so I hope she will share them with us later. She also complete the Spring wallhanging at the top of this post. These are the projects that Tammy worked on. 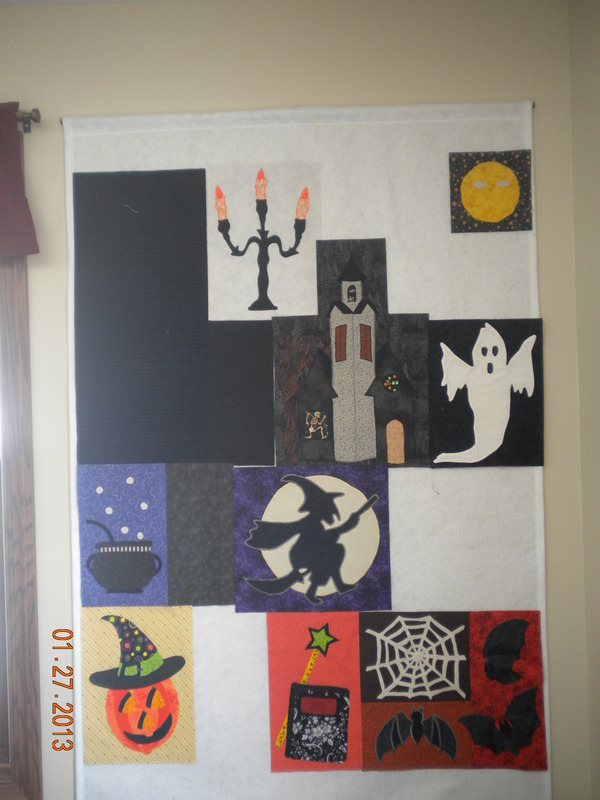 All three of us are working on the Happy Hauntings quilt that I mentioned in my earlier post “The Doctor is Hiking“. I forgot to take a picture of mine before I took it off the design board. Pam is making a smaller version and she got her skeleton finished. I think there were 112 bones in that! This picture doesn’t do these blocks justice. The colors are not true, but you can get the idea of how wonderful they look. Connie was trying to catch up on some blocks from a class she is taking from Penny Haren. If you have never done anything by Penny, you are in for a treat. 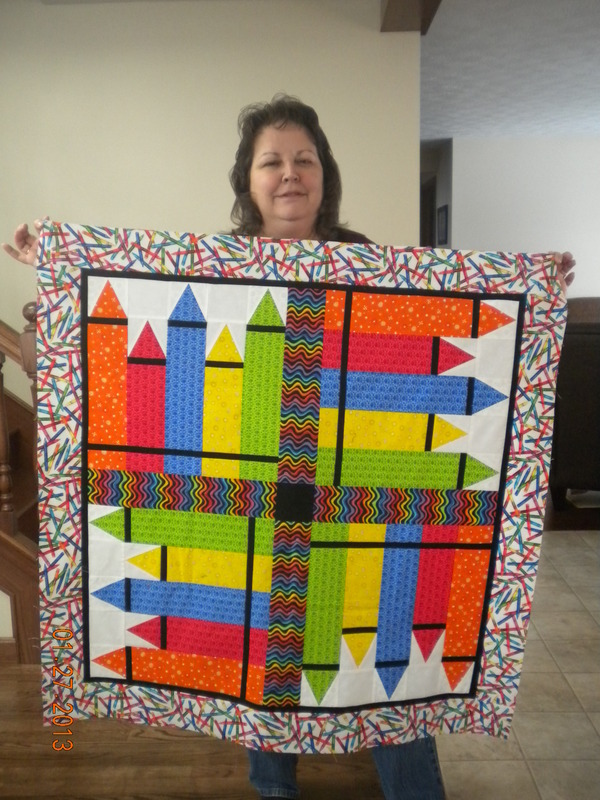 She has a unique way of looking a quilting blocks and then she will show you an amazing way to get the finished look. Penny and 9 other ladies were in Miller’s cabin and they all came up to see what we were working on. 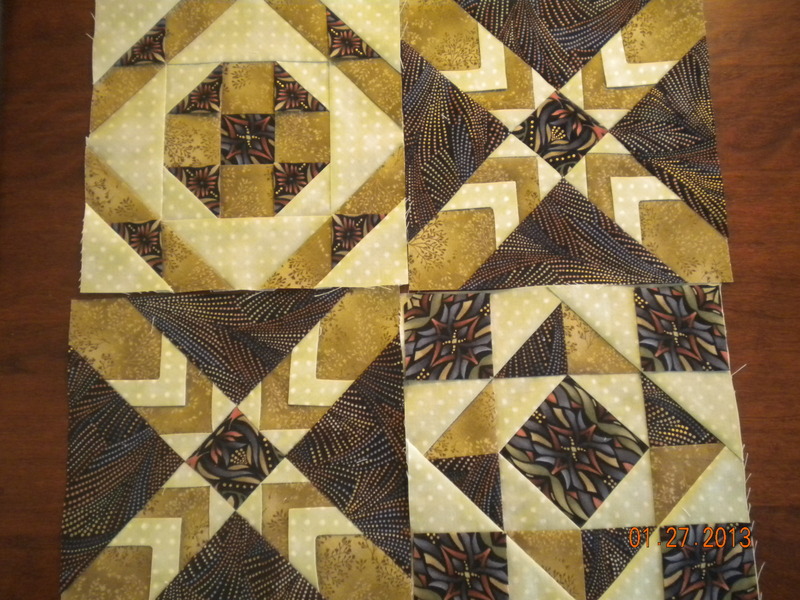 I worked on my Happy Hauntings, Winter Wonderland (hope to post it this month) and this yellow and grey quilt. Of course I made several trips next door to purchase fabric. It was great having a quilt store, but also very dangerous to the pocket book. We stayed from Friday morning until Sunday @ 3 and have already booked it for next year. Where have I been? I guess you could say I have been a victim of the “Winter Blues”. I did go to my quilt retreat last weekend and I had a great time, but on Monday I slipped back in to a “funk.” Then last night we went on a “date night” with my family and I realized what I had been missing all along was….”sister time.” I have three sisters and one brother and we are very close. Like everyone we get busy with our daily life and sometimes forget to check in with each other. So today I called my sister and decided we needed a road trip. 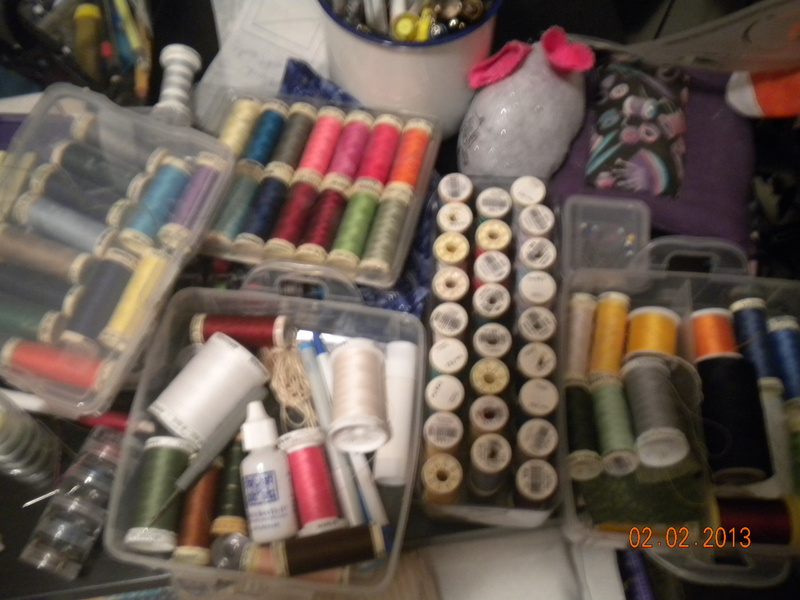 Last weekend I was working on some machine applique and realized I needed more bobbins. My local JoAnn’s doesn’t carry Viking bobbins, so we needed to travel to “the Big City”. The bonus is that they also have Panera Bread which is my FAV! 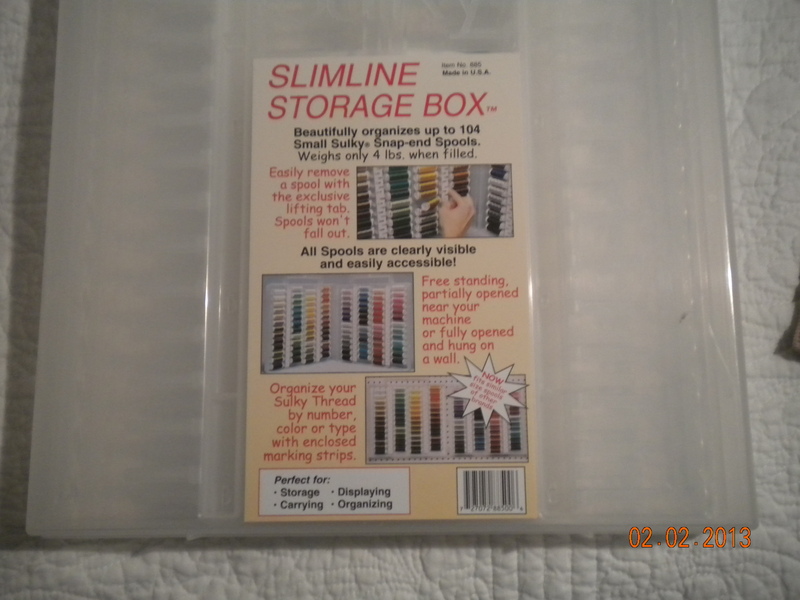 Last weekend my friend had this great container for all her sulky thread and I remembered how disorganized my thread was at home. 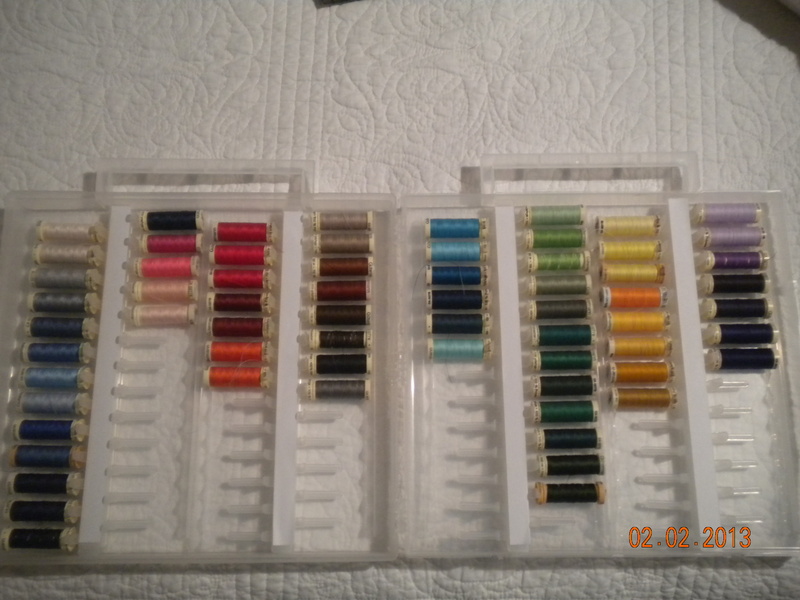 After I purchased my bobbins from a very unfriendly Viking dealer, we were off in search of the organizer. What luck… 50% off, for $15.00 my thread is now so organized. Sometimes it’s the small things that make you happy. Oh that is not the truth, the truth is it is my “sissy” time that makes me really happy. Of course, it didn’t hurt that she treated me to dinner at Panera!!! Now for true confessions…I have traded one addiction for another. That may be another reason I have not been posting! 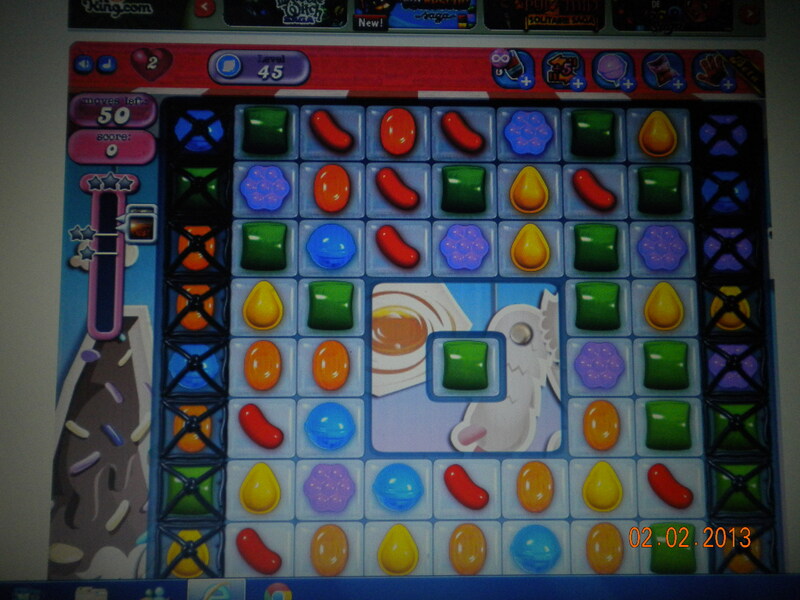 Remember my addiction to Pinterest, well my sister just had to tell me about this game she plays on the computer…Candy Crush. Never, never play it because it is so addictive. I don’t know if you can tell, but I am now on level 45. That is too many hours of playing. The worst part is I am also playing on my iphone. I am on level 54 on my phone. The good part about that is that yesterday I decided I would walk on the treadmill while I played on my phone and I have already walked an hour and a half. I am still determined to lose this weight…lol.